Just thought it should have a separate thread. With the limitless customizations of each character (especially hair), we can make almost look-a-likes of anyone (like your friend or a celebrity). I want to see what each character (when customized just right) can be a mirror image of. Examples can be Lili made to be like Morrigan (Darkstalkers) or even Law could look like my bro. Wang can definitely look like Master Yoshi. No one might feel you..
"Mr. Moody of the month"
Signature Pag Nanalo, NO MATCH!! I saw this Bryan with a name of "Hatake Kakashi" and actually looked similar to him, except for the hair. Not sure with the exact items tho, but he was wearing that green jacket(?) similar to Kakashi, the forehead protector ninjas wear (not sure what it's called @_@), assasin mask (? ), and that's about it, I guess. I'm not really familiar with Bryan's items, sorry. 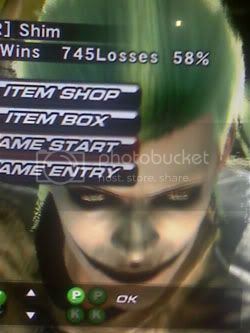 im working on making dragunov look like joker heath ledger style. check out these pics of mine. im planning on buying purple noble shirt/pants to complete the costume. : DID YOU SAY SANAE!?!? and of course my favorite, Hard Gay/Mr. Slave Law. yeah! i agree with you..
i think i saw someone with that customization same as yours. "enlighten the soul. give light to all the opposed"
Can anyone help me with famous customs? I saw one, looked like Dante from Devil May Cry. I want to make it a bit more unique. Signature "Fear less, win more." You want a piece of me, guv? "Keeping up with the pace since 1991." I really thought was in this vid..
Oh Tifa, you mean, this Tifa? Originally posted by "Die Faust"
that is one freaking hot julia.. every julia i see often has the anna hairstyle instead of one like these. 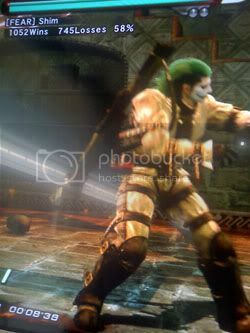 miguel can also look like dante from devil may cry 4.. the old dante version. Ed Warudo - - Kamown! The videos I've seen on YouTube and the Chreddy custom thread. I know that the tank top is not NECESSARY at all, but it is only her pink anyway. If you change the default UB punch to pink, it is not Yuna anymore.